And oh my did I find a little meme made in heaven. As a consumer culture Junkie, i am fascinated by internet memes and what makes something go viral. Obviously, a small monkey wearing a Parka at a furniture store stands a better chance than most of making it’s way onto the radar of ridiculousness. So, in an attempt to understand the genesis of this primate’s rise to fame, i did some more searching. IKEA Monkey is the nickname given to a Japanese snow macaque named Darwin that was found loose wearing a coat at a Canadian IKEA store in December of 2012. 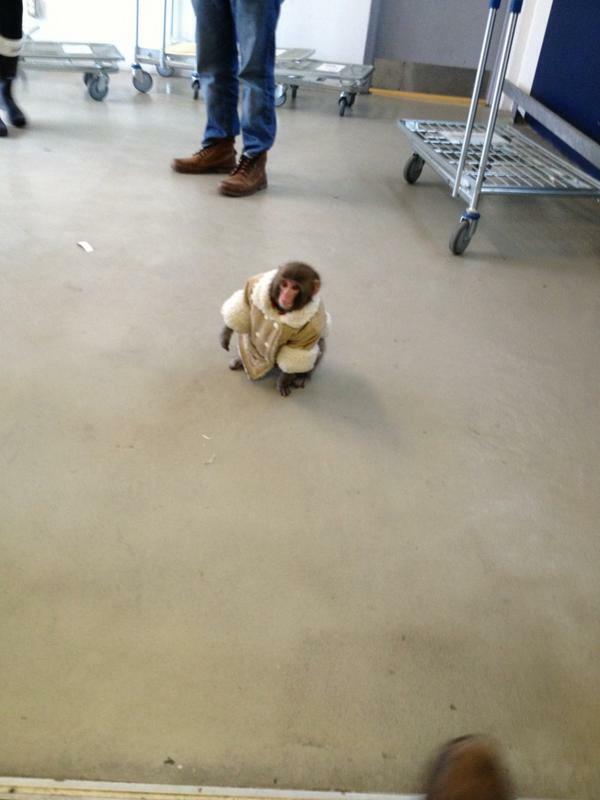 Twitter user Bronwyn Iler Page tweeted a photograph of a Japanese snow macaque monkey wearing a shearling coat at an IKEA store in Toronto, Canada on December 9th, 2012. Within three days, the tweet received over 415 retweets and 158 favorites. The same day, Twitter user Lisa Lin tweeted a new photograph of the same monkey standing in front of a window at IKEA, receiving over 120 retweets and 40 favorites within the next three days. As the photograph of the monkey began spreading online, the @Ikea_Monkey novelty Twitter account was created, which posted tweets from the perspective of the juvenile macaque. 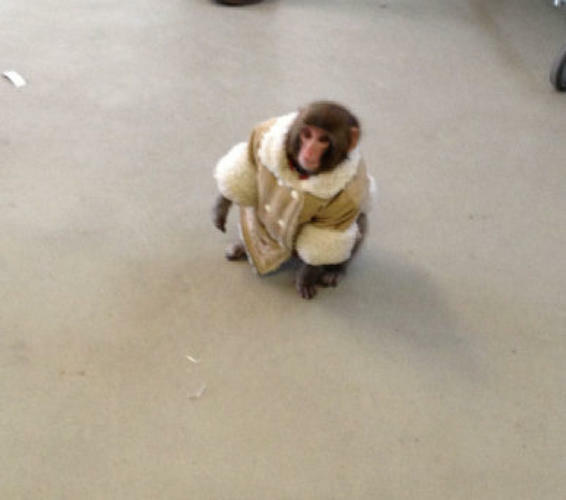 That same day, Gawker published an article titled “Shearling Coat-Wearing Monkey Found Wandering Around Canadian Ikea,” which reported that the monkey was roaming the store for an hour before animal control arrived. The article was later updated to include tweets from Tom Podolec of CTV News, who reported that the six-month-old macaque would not be returned to its owners. 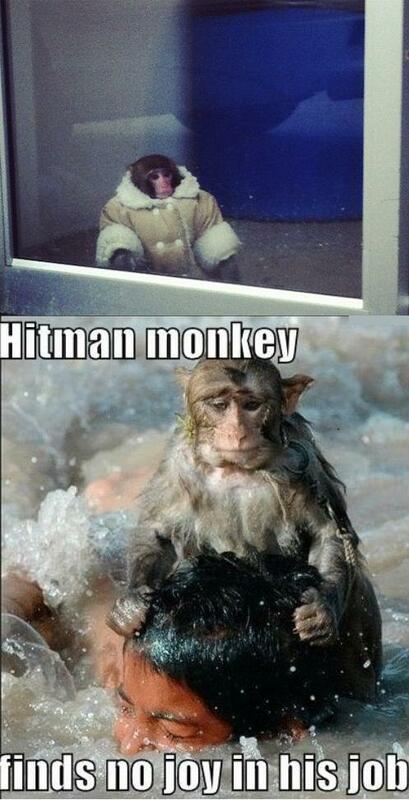 #IkeaMonkey is a Rhesus Macaque Monkey Approx. 7 months old. In good health; stressed. Jacket is wool and said to be his favourite. On December 10th, Redditor toucher submitted Bronwyn Page’s photograph of the monkey to the /r/WTF subreddit, where it received over 18,700 up votes and 440 comments within 24 hours. The same day, Redditor go4 submitted a post titled “IKEA Monkey Explanation” to the /r/funny subreddit, which featured an I Should Buy a Boat Cat image macro with the caption “I was supposed to pick up Carl” above Lisa Lin’s photograph of the IKEA monkey (shown below). Within 24 hours, the post received over 30,400 up votes and 350 comments. 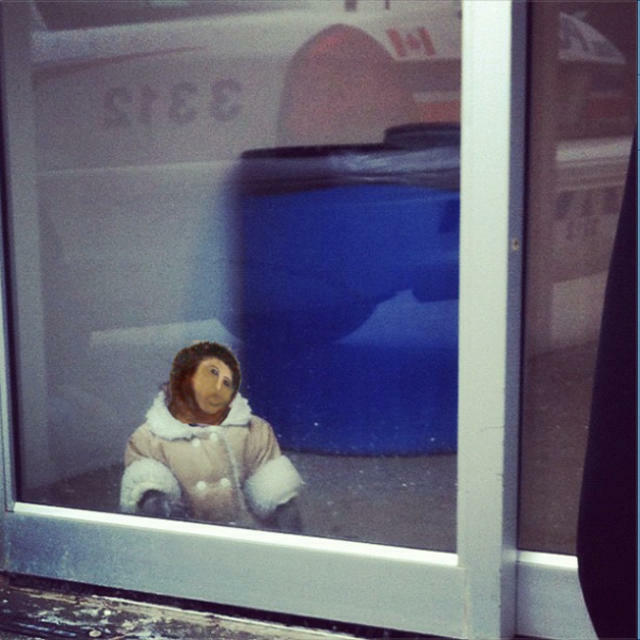 Also on December 10th, Redditor eppemsk submitted an image macro titled “IKEA Monkey contemplates past life choices” (shown below, left) and Gawker published a follow-up article titled “The Best of IKEA Monkey, the Meme,” highlighting several image macros and photoshopped pictures of the IKEA Monkey. On December 10th, CBS News published an article titled “Twitter goes bananas for #IkeaMonkey,” reporting that the hashtag #IkeaMonkey accumulated over 2,300 tweets that day. As of December 11th, 2012, eight Facebook pages with “Ikea monkey” in the title have been created. On December 11th, ABC News published an article titled “‘IKEA Monkey’ Owner Vows to Fight for Primate’s Return,” reporting that the monkey’s owner Yasmin Nakhuda was attempting to have the macaque returned to her from the primate sanctuary where it had been taken. Nakhuda revealed that Darwin had escaped from his crate in her car while she was in the IKEA and had been taken by animal control before she returned. Follow the monkey on Twitter?